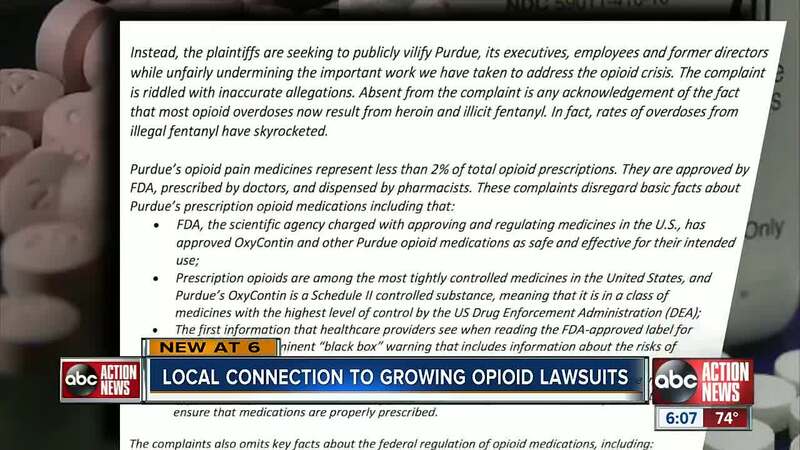 More than 600 cities and counties from across the country have filed a federal lawsuit against the family who owns Purdue Pharma — the maker of OxyContin. I-Team Investigator Kylie McGivern found there are local connections in the growing legal battle. Out of the hundreds of governments filing suit, six are in the Tampa Bay area. They include Bradenton, St. Petersburg, Pinellas Park, Hernando, Pasco and Pinellas counties. The suit names eight members of the Sackler family, accusing them of falsely marketing opioids as safe and non-addictive, leading to thousands of overdose deaths. The lawsuit states the Sackler family's "ruthless marketing of painkillers has generated billions of dollars - and millions of addicts," noting the family's wealth is estimated at $13 billion. It goes on to say the family members had the power to decide how the addictive drugs were sold, getting "more patients on opioids, at higher doses, for longer, than ever before" and that they should be held accountable now. In a statement, Purdue Pharma denied the allegations, going so far as to say, "We believe that no pharmaceutical manufacturer has done more to address the opioid addiction crisis than Purdue, and we continue to work closely with and governments and law enforcement agencies on this difficult social issue." Wednesday, one of the attorneys representing our local governments, told the I-Team the defendants have requested the case be transferred to the United States Judicial Panel on Multi-district Litigation. More than 1,600 cases have been filed in federal court, with the first trial set for October. On Tuesday, Purdue Pharma reached a $270 million settlement with the state of Oklahoma. It's significant, because it could help determine how other lawsuits play out.